Celebrate Computer Science Education Week with BrainPOP! BrainPOP loves Computer Science Education Week (December 3-9), and this year we are providing more activities, resources, and events than ever before! We recently launched Creative Coding — an exciting new BrainPOP add-on. Developed in partnership with Scratch and Vidcode, Creative Coding features block- and text-based coding projects linked to every BrainPOP topic across the K-12 curriculum. And the best part of all — no coding experience necessary! 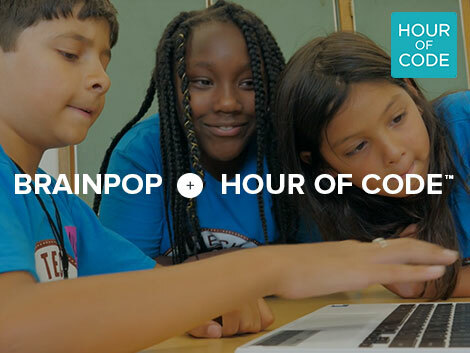 Celebrate Hour of Code — the global movement for every student to try computer science for one hour — by entering a Creative Coding contest* sponsored by BrainPOP and Mouse — a nonprofit that empowers youth and educators to engage with computer science and creative technology to solve problems and make meaningful change. The challenge is to code a comic or meme on the theme of “creativity” using BrainPOP’s Creative Coding with Vidcode platform. Students submit their projects by December 9 for a chance to win one of several prizes, including gift cards to AdaFruit to purchase fun DIY electronics and learning kits, a Makey Makey Go, and an Elegoo Arduino kit. Don’t have a Mouse Create Spark Membership? Get the details on how to sign up for a free account here. Already a Mouse Spark Create Member? Find the BrainPOP Microproject in the Project Finder on Mouse. BrainPOP’s Creative Coding is an official Hour of Code activity this year! To encourage your students’ participation, we are offering a FREE trial of Creative Coding during Computer Science Education Week. Students can choose a Scratch (block-based) or Vidcode (text-based) project for sixteen different topics across the curriculum. To choose a project, visit Hour of Code and select BrainPOP from the “Created By” drop-down menu on the left. If your school already subscribes to Creative Coding, log onto BrainPOP and look for the Creative Coding tile on the right side of any topic page for the full coding experience. This month, Certified BrainPOP Educator Nay Belaunzarán led a webinar on how she is successfully using Creative Coding in her classroom. Watch the webinar and discover Nay’s strategies for integrating coding into the curriculum. We Are Teachers – An article featuring eight great ideas for how to use BrainPOP’s Creative Coding projects from a fellow teacher. Coding Professional Development – Register for an upcoming webinar, or view recordings from the archive. To top it off, BrainPOP is highlighting computer science topics throughout the week, including Variables, Functions, Logic Gates, and Computer Programming. Visit BrainPOP.com with your class each day to explore the featured topic!